Managing an eCommerce store is never easy. 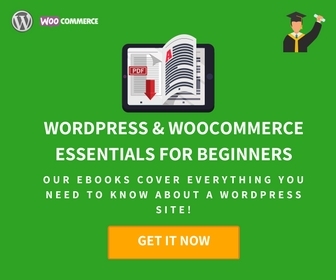 WooCommerce is one of the most popular platforms that will help you create an eCommerce store. In today’s digital landscape, thankfully, there are a lot of options to automate multiple aspects of your store. Your marketing initiatives, shipping service integration, inventory management, promotional strategies, CRM, etc., can be automated. 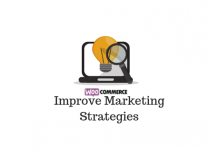 Thankfully, in the WooCommerce ecosystem, you will find a range of tools that will help you automate multiple aspects of your store. In this article, we will discuss some of the best plugins that will help you automate your WooCommerce store. These plugins will help you in varied functionalities and should be an asset to reduce the burden of manual efforts on your store. One of the most important things you can automate on your WooCommerce store is the regular follow up emails that you need to send. In your busy schedule, consistently sending personalized emails to different customers manually is not worth it. This plugin will help you interact and engage with your customers by creating regular follow up campaigns. These campaigns will be based on the interests as well as purchase history of your customers. The aim will be to promote engagement and thereby increase the chances of repeat purchases by customers. 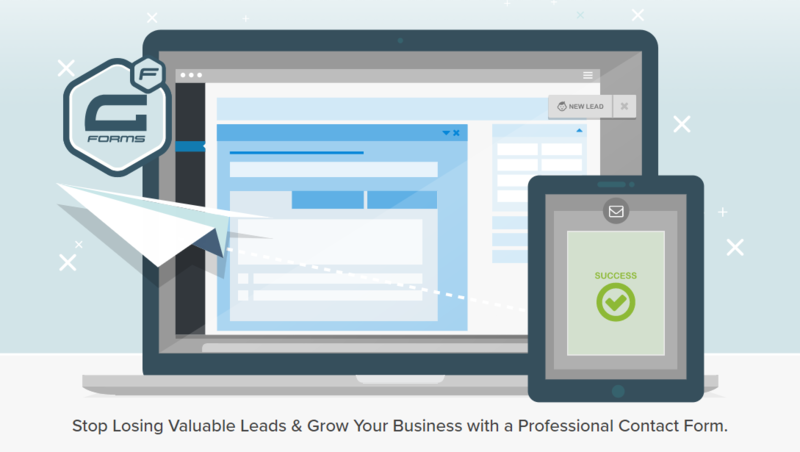 Create email and twitter campaigns for regular engagement with your customers. 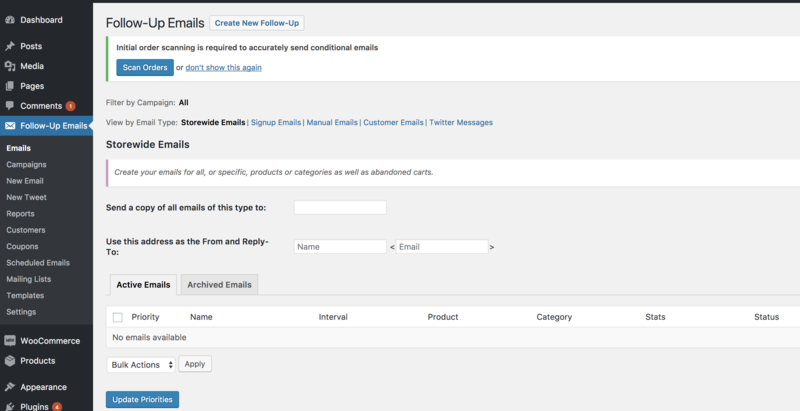 You will be able to create emails in a WordPress-post-like interface. The plugin allows you to club together multiple emails and tweets to form campaigns. Detailed reporting features to help you measure the efficiency of your campaigns. Schedule communication based on various considerations of your store strategy. Easily modify the schedules according to changing requirements. Manage mailing list effortlessly, where you can import new mailing lists or add an email to an existing list. Free email templates to help you start with your campaigns. You can also create fully customized templates on your own. The single site license of this plugin would cost you $99. This plugin will help you create an extensive strategy for creating and managing discount coupons in bulk on your WooCommerce store. It will help you set up an elaborate coupon strategy on your store to improve sales figures whenever you need it. 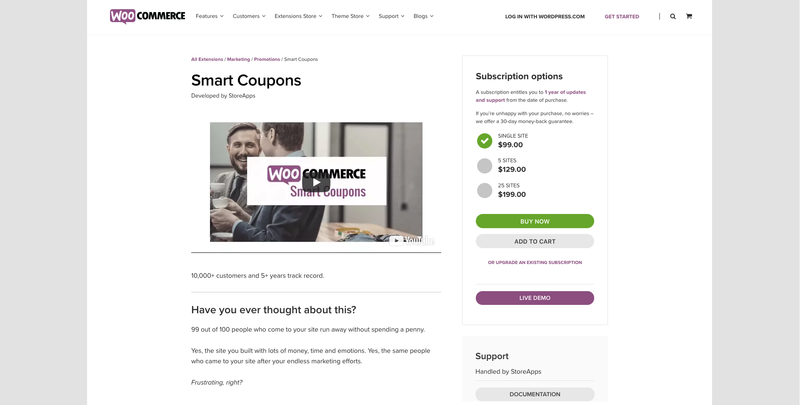 Create and maintain an efficient WooCommerce coupon strategy with the help of Smart Coupons. Generate and dispatch coupons in bulk and import or export them via CSV. Associate coupons to product purchase so that you can ensure repeat purchases on your store. Offers a store credit system for customers where they can maintain a fund balance. Gift cards with custom messages. Display available coupons on Cart and My Account pages. If you don’t want the hassles of coupon codes, here is an option that you can use to set up price adjustments at product, category and cart levels. This plugin will help you configure dynamic price adjustments on your store based on the discount rules that you configure. ELEX Dynamic pricing plugin is a great way to set up dynamic pricing and discounts in your store. Create flat rate or percentage discounts at product, category or cart levels. You can also assign a fixed price for your products using this plugin. Option to create combination discounts to encourage cross selling. Offer personalized discounts to customers based on their email address or user role. 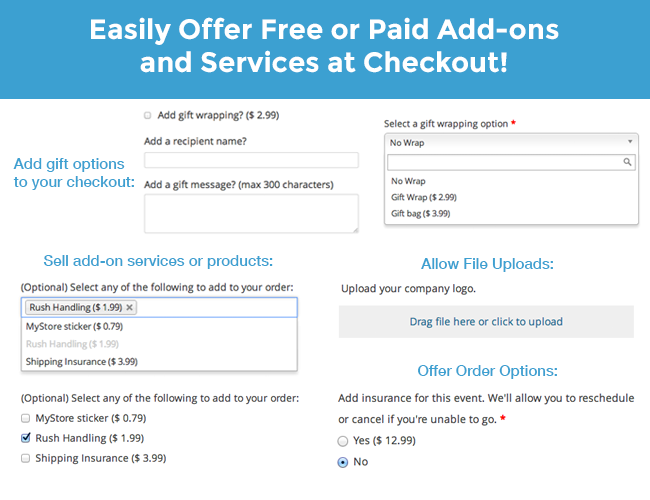 You can also configure discounts based on the purchase history of a customer using this plugin. Configure Buy One Get One (BOGO) offers where the free product is automatically added to the cart. Configure cart rule discounts based on attribute, shipping method or payment gateway. The single site subscription of this plugin would cost you $79. 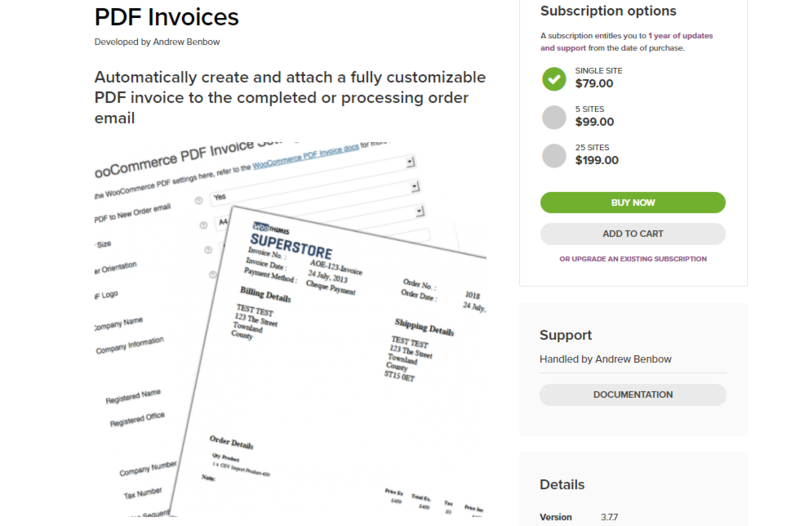 This plugin will help you attach a PDF invoice to the order completion email automatically. Customers will be able to access their previous invoices from the My Account section as well. And store admins will be able to download or email the invoices from the backend also. This is a great plugin to automatically generate and attach PDF invoices to the order completion mails to your customers. Customize invoice templates according to your store branding and design. You can include your company logo, tax number, etc. Option to attach the invoice PDF to the new order emails sent to store admins. Invoice details will be integrated to your order details section as well. The single site subscription of this plugin is $79. When you receive an order, there might be other people in your supply chain you want to inform. Your fulfillment and procurement team would be better equipped if they are able to get real time information on orders on your store. This plugin will help you automate this process by helping you configure stock and order notifications to specific people. Timely notifications related to your orders and stock level to your team members or suppliers would help in improving efficiency of your order fulfillment process. Set up these notifications for individual products, product categories or shipping classes on your store. 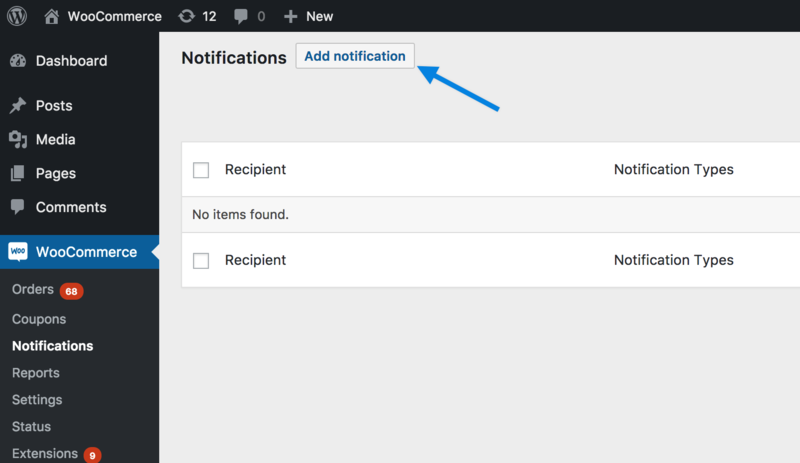 You will be able to choose specific items from an order for these notifications. If there are multiple items in an order, you can show price or other details of a single selected product. A single site subscription of this plugin will cost you $29. Customer support is another area where automation can help a lot in streamlining the workflow. If certain categories of customer queries are automatically redirected to a particular department or support agent, your workflow will be more efficient. 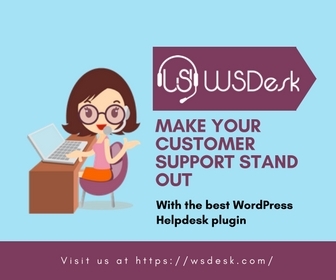 WSDesk is a WordPress help desk system that can do this and a lot more. WSDesk is a popular WordPress help desk system that offers complete control of your data. Create a help desk system on your WordPress store, where there is no limit on the number of agents or tickets. Ajax-based UI, which will enable a super fast customer support system even when you are handling large volume of tickets. Email pulling feature where emails sent to your support id will be automatically converted to tickets. Triggers and automation to streamline the workflow of your customer service department. Canned responses and rich text formatting to help support agents to communicate faster and more efficiently. The single site subscription of this plugin is priced at $89. You might be using a range of third party services to manage your WooCommerce store. Integrating each of these services can be a difficult task for you. Zapier will help you here with options to send order, customer and subscription data to a large number of services. Automatically integrating with various external services and apps that you use regularly would mean a lot less manual work. 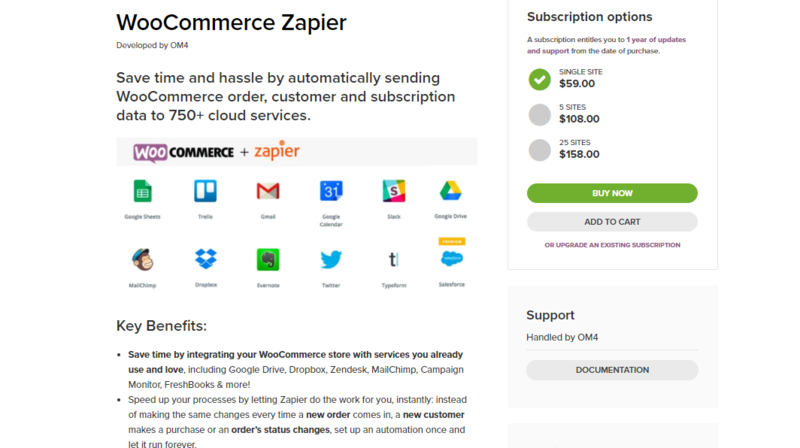 Integrate several third party services like Dropbox, Zendesk, MailChimp, Google Drive, etc., to your WooCommerce store. Automatically pass on updates on your store to the selected services. eCommerce events like new order, order status update, new customer, etc., will be passed on. Helps you take appropriate steps to reduce cart abandonment. Notify members in your team for more efficient fulfillment or restocking. Detailed reports to understand store performance. The single site subscription of the plugin is priced at $59. Exit intent popup is a proven strategy to engage with your customers and prospects more efficiently. This free WordPress plugin will help you customize your popups the way you want. 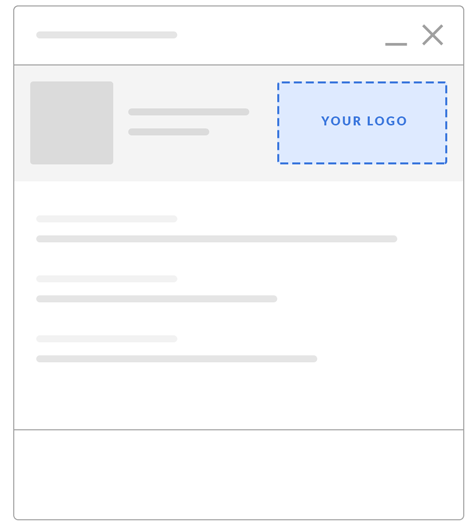 A range of popup options including opt in forms, notification, slide out, floating, and more. Works well with most of the popular form building plugins. Unique popup editor to personalize the popups. Conditional logic to target users more efficiently. Integrating your WooCommerce store with a popular shipping carrier is another common scenario for store owners. ELEX EasyPost plugin will help you integrate FedEx, UPS and USPS services on your WooCommerce store. With the help of the plugin, you can display live shipping rates, print labels and configure box packing. Postage for the labels you print will be automatically deducted from the respective carrier account. This plugin uses EasyPost API to help you display rates and print labels on your WooCommerce store. Display services and rates of FedEx, UPS and USPS. Print shipping labels by automatically paying postage. Configure box packing based on the requirements of your products. Provide tracking code to customers. The single site subscription of this plugin costs $69. Cross selling is one of the tried and tested strategies to improve average sale value on your store. With the help of this plugin, you can provide automatic recommendations based on users’ page views, purchase history and products that are purchased together. Automatic product recommendations will help your customers find related products on the site, which they might consider for purchase. Overall, this plugin makes your up sells and cross sells more targeted. Create product recommendations based on user’s product view, purchase history. Also display recommendations based on products purchased together. Widget to help you display recommendations. Adding a paid service such as one-day delivery or gift wrapping can improve customer satisfaction as well as order value. Add fields on the checkout page to let customers choose add-on services. Make the add-on options paid. Option for admins to view from add-on fields from order details page. If you are selling certain services on your store, you probably want your customers to purchase a spare part from you as well. This process can be automated using this plugin. When a customer purchases a product, an associated product can be automatically added to the cart. You can make this process optional or mandatory with the plugin. You can link products to a main product while maintaining the individual pricing of the forced product. 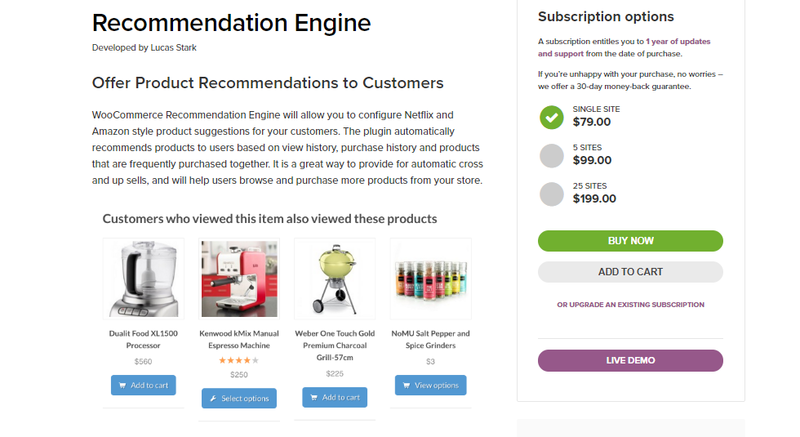 This extension will help you create product bundles on your store and offer them at a discount. You can set a price for the main product, or set individual prices for each product in the bundle. When customers add the main product in the bundle to cart, the linked product will be automatically added with their prices configured. The single site subscription of this plugin would cost you $49. The chained products come with the main product, without separate pricing. Options to customize products will be an attractive feature for eCommerce customers. 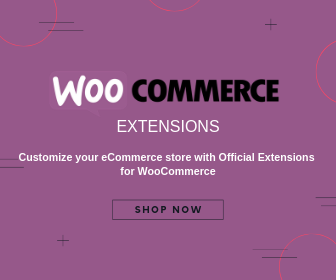 This extension will help you create customizable products on your WooCommerce store. You can offer a choice of products for each component of a complex product with the help of this plugin. Flexible options to set pricing and shipping options for products. 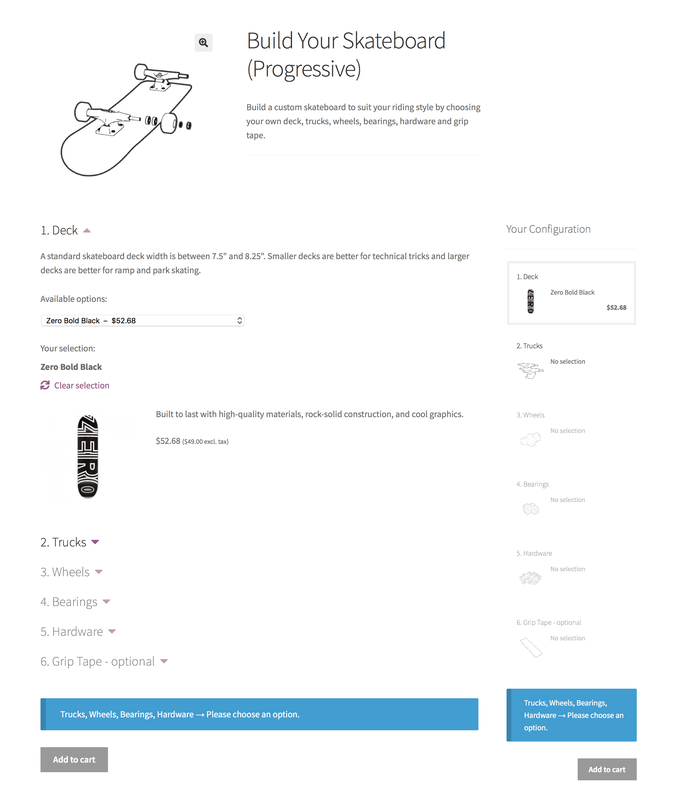 Customize the layout options of your products. It is important to track your eCommerce specific data on your site. This extension will help you include such specific tracking metrics to your analytics panel. Several advanced eCommerce events can be tracked using this plugin, such as changes in cart quantity or coupon addition. The extension also offers support for shopping behavior and checkout behavior analysis reports. A single site subscription of this plugin would be $79. 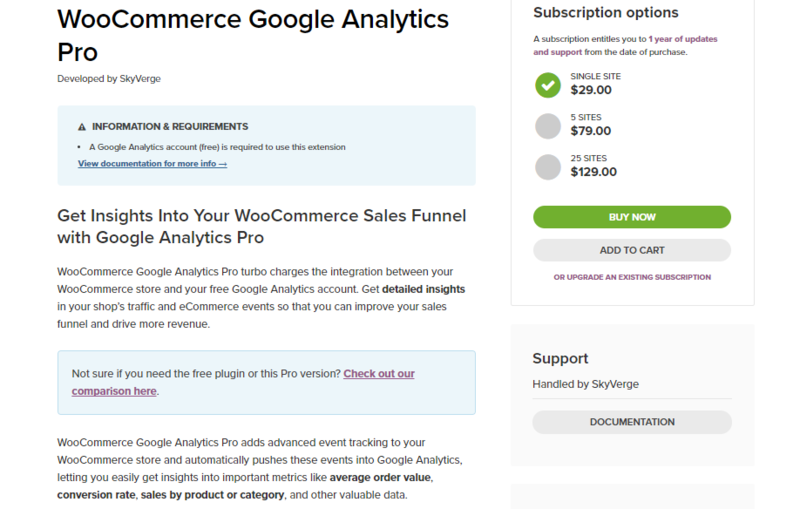 WooCommerce Google Analytics Pro extension provides better integration of your store events with your analytics account. Submitting a product feed to Google Merchant Center can improve the visibility of your products considerably. After submitting the feed, you need to update it at specified intervals recommended by Google. With the help of this plugin, you can schedule automatic updates of your feed. This way, any changes you make on your site will reflect on Google Shopping listings as well. 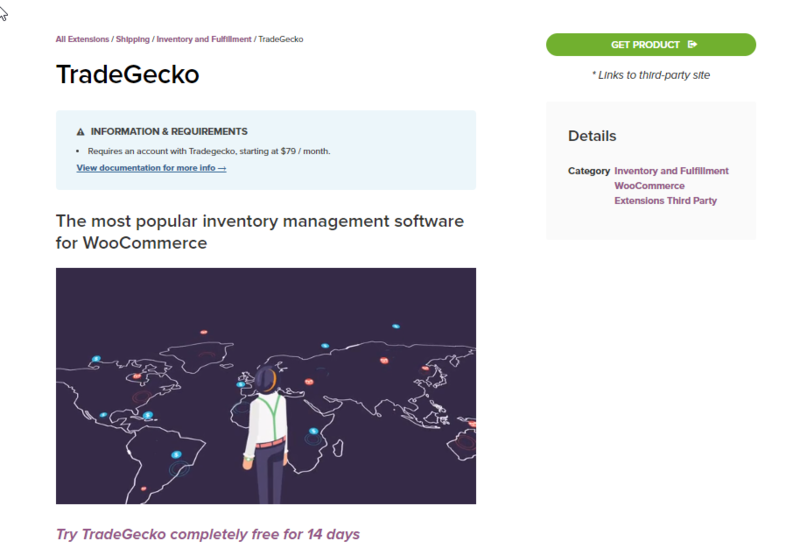 By integrating your store with TradeGecko, you will be able to create a centralized system to manage your store as well as the supply chain. Here is a list of obvious advantages of the plugin. Expand your sales channel by exploring multiple marketplaces. Easily connect your store to accounting services. Create workflows to automate order routing. Stock management made more easy with TradeGecko app. In addition to providing fast resolution to customer queries through a live chat window, LiveChat also offers great lead management options. You will be able to get active user information on your site and proactively engage with them on sales leads. LiveChat provides seamless integration with a large variety of tools that you might be using to handle eCommerce data. You will also find it extremely easy to use with a simple interface. You can signup for a free trial for 30 days to understand more about the features. Along with 4 unique themes, you will be able to customize the chat window with your logo, custom text and website colors. 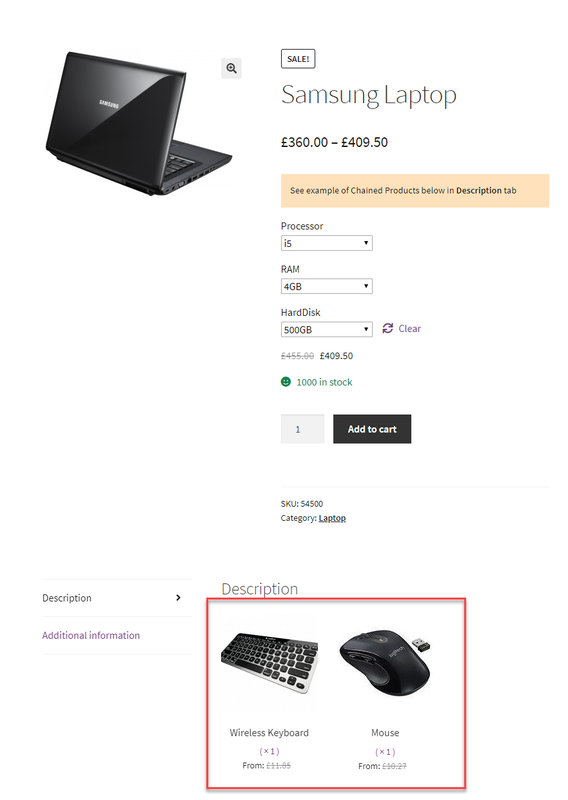 You can create advanced product add ons using conditional logic with the help of this WooCommerce extension. The extension supports a range of standard and advanced fields of gravity forms. The single site subscription will cost you $99. You may want to associate specific shipping or payment options with some of your products. 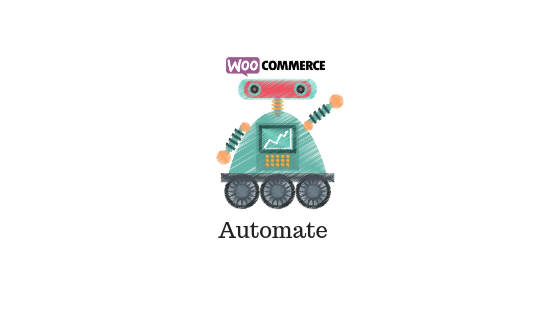 This plugin will help you automate this aspect on your WooCommerce store. 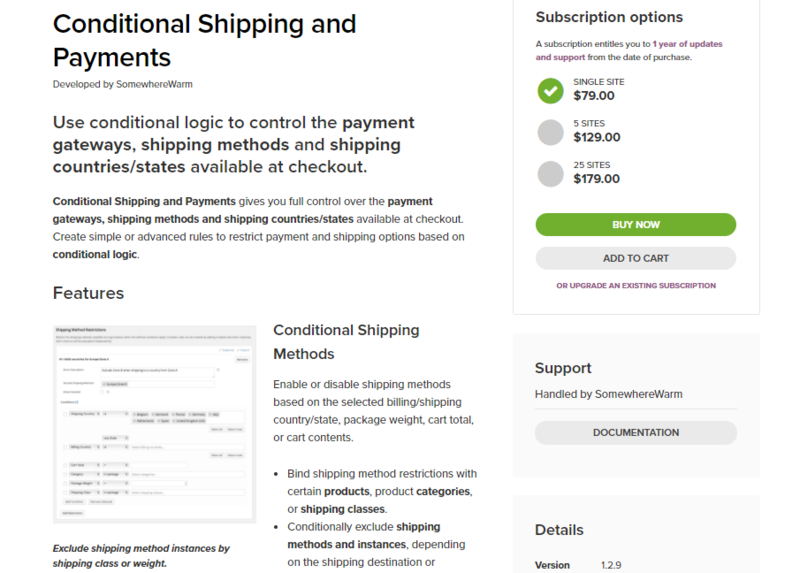 Restrict shipping and payment options on your WooCommerce store based on a variety of conditions. Helps you ship the products with the best shipping method. Restrict shipping and payment options based on user roles. Restrict shipping options based on the country of the customer. The single site license of the plugin would cost you $79.